One day, Parvati closed the eyes of Lord Shiva. The whole world became dark. The intense heat produced by Shiva’s third eye combined with his sweat gave birth to a blind and deformed child – Andhaka. During this period, the demon Hiranyaksha was trying to please Lord Shiva and get a powerful son. 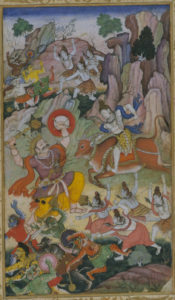 Lord Shiva appeared before Hiranyaksha and gifted him his son Andhaka, with the warning that if Andhaka did something wrong, he himself would kill Andhaka. Andhakasura was blind, cruel, physically weak, but extremely strong willed. As Andhaka grown up, he got boons from Lord Brahma. If his blood were to touch the Earth, from each drop of blood a new Andhakasura would develop. This special power made him undefeated in the wars and he conquered the entire world. One day, Andhakasura saw Goddess Parvati, and decided to marry her. In the fight that followed, every drop of Andhakasura that touched the earth formed a new Andhakasura. Finally, Shiva was supported by Shakti (Mahakali / Rakta dantika). She drank all the blood that came out and ate up all the new Andhakasuras that were developed. Shiva lifted Andhakasura with his Trishula, and burnt Andhakasura with the fire of his third eye. When Andhakasura asked for forgiveness, Lord Shiva forgave him. Lord Shiva transformed him into Bhringi, the leader of his Ganas – his Ganadhyaksha. Rudra sagar was formed by the foot print of Mahakaleshwar when he came to kíll Andhakasura, and Koti teertha was formed by Lord Shiva’s toe.